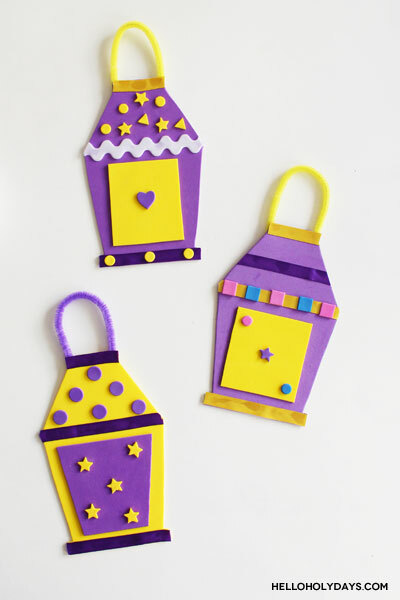 Ramadan Foam Lanterns Craft – Hello Holy Days! 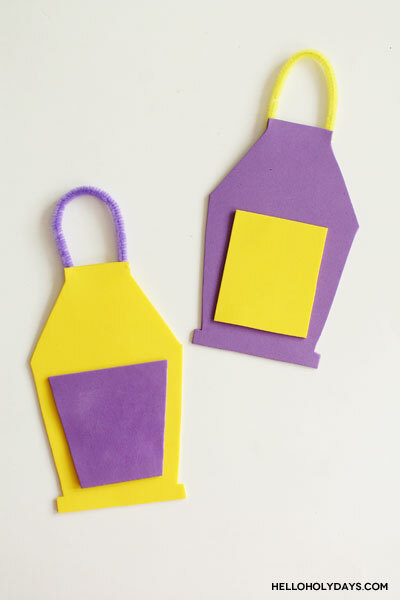 These Ramadan foam lanterns are a great craft for children ages 3+. 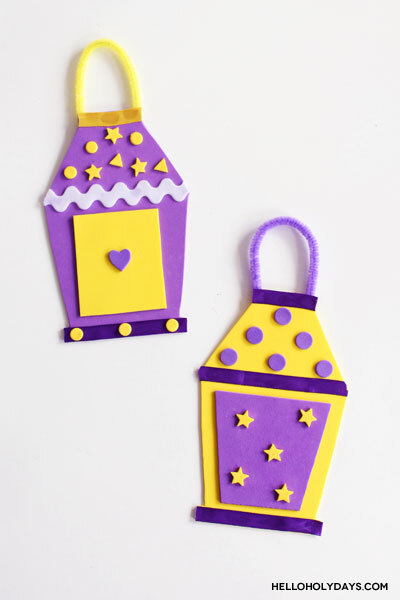 The craft is easy to set up and kids will have a ton of fun customizing their own purple and yellow lanterns for Ramadan! 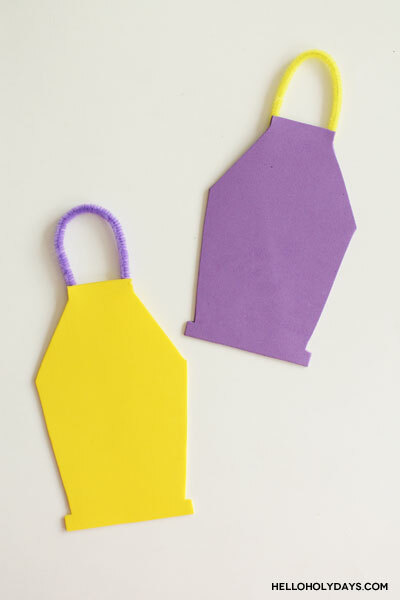 Whether you do this craft at home or in a classroom (for educators looking to teach about different holidays) this craft is sure to be a hit with the kids. I also recommend cutting the window pane shape in advance for small children; cutting out strips of ribbon in advance is also helpful for small kids but not necessary as you might want them to practice their scissor skills. Older children might like to do the craft by themselves from start to finish and may even like to add special touches like glitter glue to customize their lanterns. 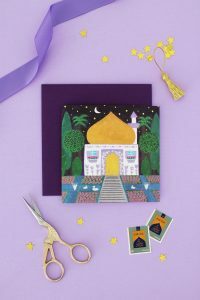 This craft can also be taken to go – for example take it with you to the mosque to keep kids busy during taraweeh prayers. Instead of a tray, stick the lantern template, window pane shape, foam stickers, ribbon and glue dots into a ziplock bag. 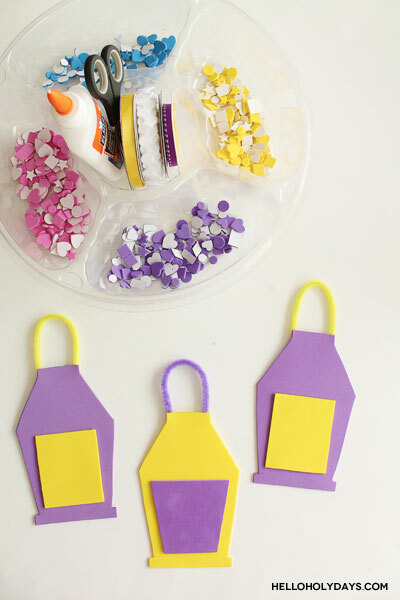 (Glue dots will be a lot less messy than regular white glue when taking this craft on the go.) Kids can easily keep busy by decorating the lantern with all the materials in their ziplock bag. Download my free lantern template. Print and cut out. Trace the template onto the foam sheets. Cut out the lantern shape and the window pane shape. 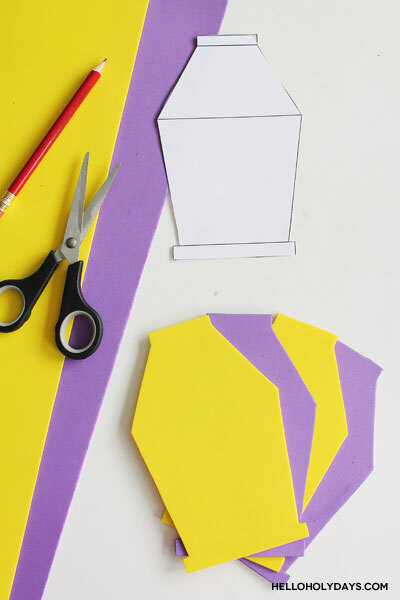 (You can also cut out a simple rectangle for the window pane if desired). Next, cut a portion of the pipecleaner and bend it into an arch shape. Hot glue this to the back of your foam lantern shape. This will be the handle. Have children glue on the window panes to the lanterns and then decorate the lanterns with the foam sticker shapes and ribbon, customizing however they like! *Please note all of Hello Holy Days! free templates are for personal or educational use. The template nor this craft should not be made or adapted for commercial purposes.